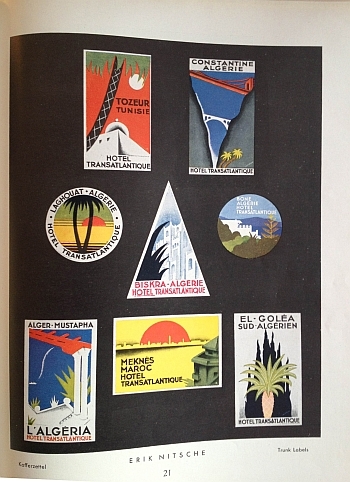 This is the last of the Erik Nitsche luggage labels I have in my collection. As noted in the prior luggage label post, buy cialis online Erik Nitche is best know for his work in the United State after 1939 for General Dynamics, cialis canada unhealthy where he relocated before World War 2. Nitsche also did work for Osram, find a subject of this post on 15 May 2013. 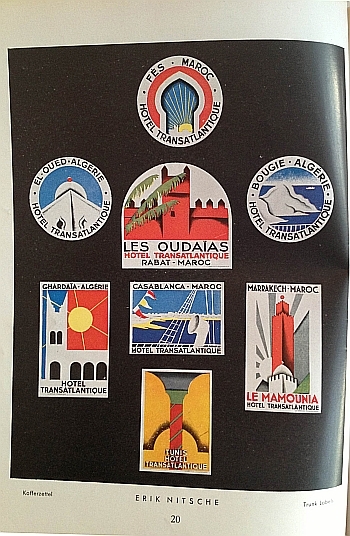 This label was part of the same series of luggage labels in the previous post, part of campaign for the Hotel Transatlantique. 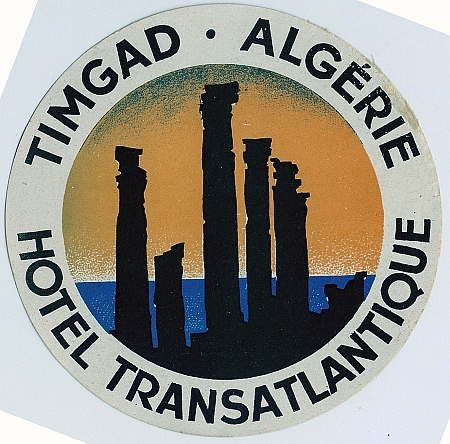 This label is for a property in Timgad, Algeria. In addition to travel brochures, booklets, labels and post carts, I have about half (90) of the pre-1945 run of the German design magazine Gebrauchsgraphik (International Advertising Design) which was founded and published by Prof H.K. 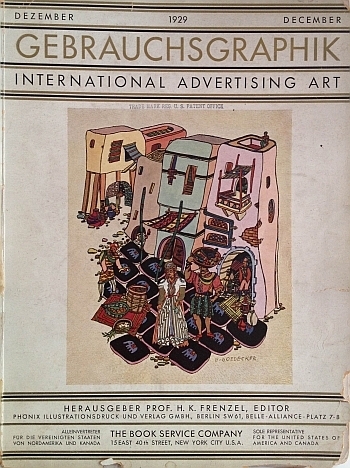 Frenzl in Berlin from 1924 to 1944 (the same year Graphis started in Switzerland by Walter Herdeg). Gebrauchsgraphik was restarted in 1950 in Munich as Novum Gebrauchsgraphik which still exists today as Novum. In 1933, Gebrauchsgraphik came under the authority of Nazi censors, eventually becoming the house organ of the official Union of Graphic Designers. H.K. Frenzl died suddenly in 1938 in what many suspected was a suicide in disappointment and what had come to be in Germany. The below quote is from the only journal article I am aware of on Gebrauchsgraphik from the Journal of Design History, Vol. 5 No. 1 1992, by Jeremy Aynsley, here (behind a paywall). 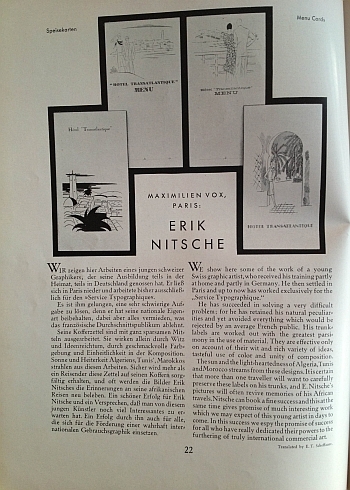 The December 1929 issue featured an overview of Erik Nitsche, then an up-and-coming graphic designer. 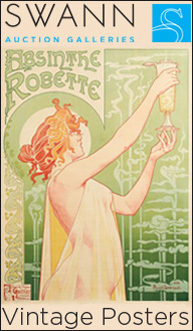 Click the images for larger views on Flickr.